Born in St. Petersburg in 1904, Alexander Vvedensky grew up with a mother who was a gynecologist and a father who was an economist. From 1917 to 1921 he attended high school, meeting Leonid Lipavsky and Iakov Drusky, who would become the major philosophers in his circle. From his teacher, L. V. Georg, the young boy learned of the latest developments in Russian poetry, including Futurism and other experimental poetries. He started at the university after high school, but soon dropped out. His major poetic education took place at GNKhUK, the State Institute of Artistic Culture, headed by Kazimir Malevich, with researches into zaum (sound) poetry by Igor Terentiev, for whom Vvedensky worked. In 1925 he and his high school friend, Iakov Druskin, became friends with the aspiring poet Danill Kharms, who was a student of the Futurist sound poet Alexander Tufanov, himself experimenting with theories of zaum thorough narrative time. For the next year and a half, Vvedensky, Nikolai Zabolotsky and Kharms sought to establish an organization that would unite all avant-garde and left-wing artist of Leningrad. The first of their radical projects, the theater company Radix, “experimenting in the area of non-emotional and plotless art and aiming to create a pure theater not subject to literature,” fell apart while rehearsing the Kharms and Vvedensky montage My Momma’s Got Clocks All Over. They also made attempts to join forces with Malevich, but after political denunciations in the press forced the closure of GINKhUK, Malevich left for Warsaw. In late 1927, they were offered a base at the Leningrad Press Club on the condition that they assume a new name, since the word “left-wing” sounded to authorities to be to close to Trotsky’s views. Thus was born OBERIU, a neologism standing for the Union of Real Art. The same year, children’s writer and editor Nikolai Oleinikov invited OBERIU members to write for the State Publishing House for Children (DETGIZ). Vvendensky would later confess that he was attracted to children’s literature because it was non-political, allowing him to experiment with nonsense. Neither he nor Kharms achieved greatness as writers for children, but it allowed them to work on their more serious writing. OBERIU was unable to publish most of their writings, but the organization to provide raucous performances in Leningrad clubs and educational institutions. Transpiring under nonsensical slogans hung for the occasion, the performances united poetry, theater, film, magic tricks, juggling, and general clowning around; they culminated in debates that often turned into shouting matches. The State’s tightening control over the arts, threatened these performances, however, and audiences grew increasingly hostile to their work. After an April 30 th reading at Leningrad State University, OBERIU was forced to dissolve because of newspaper accusations of counterrevolutionary activity. The press also voiced accusations against their children’s writing. Vvedensky and Kharms were detained in December of 1931 along with other members of OBERIU. 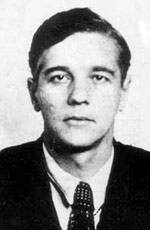 Vvedensky, suffering hard imprisonment, cracked under interrogation, naming others and admitting his guilt. He was sentenced to three years of internal exile, forced to remain away from major population centers. By 1933, however, both his term and Kharms’s was reduced, and they returned to Leningrad, allowed to write children’s books but not to compose poetry. The avant-garde movement was over, and they wrote privately only for their friends. Polnoe sobranie sochinenii (Ann Arbor, Michigan: Ardis, 1980); Polnoe sobranie proizvedenii: v dvukh tomakh (Moscow: Gileia, 1993). In Russia’s Lost Literature of the Absurd: A Literary-Discovery. Selected Works of Daniil Kharms and Alexander Vvedensky, edited and trans. by George Gibian (New York: Norton, 1974); Oberiu: An Anthology of Russian Absurdism, translated by Eugene Ostashevsky (Evanston, Illinois: Northwestern University Press, 2006); An Invitation for Me to Think: Poems (Los Angeles: Green Integer, 2007). Copyright ©2006 by Douglas Messerli and Green Integer.